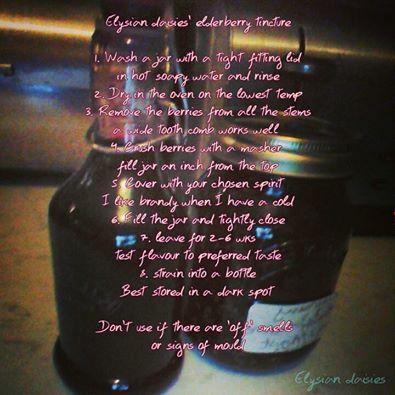 preserving food: Dehydrating, jams, syrups, tinctures, pickles, cordials, brews, ferments. Kombucha is expensive as an organic healthfood drink. I have to also point out that success rates using the bought ones as a starter tea are low. It seems there isnt enough of the good stuff in what you can buy. More reason to make it. 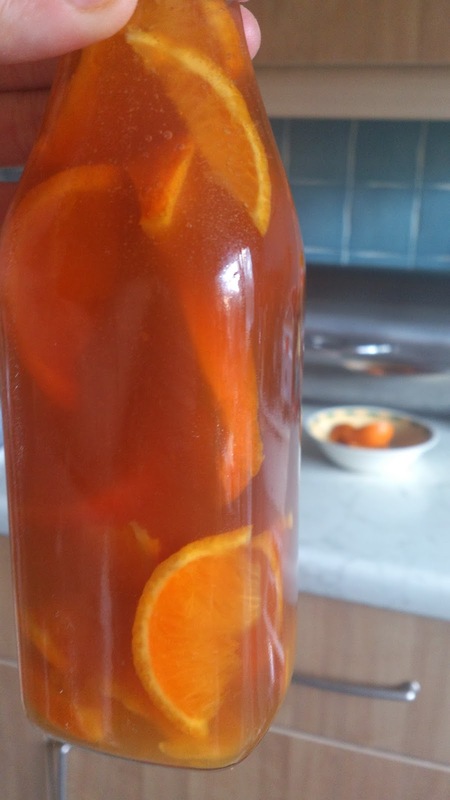 It starts out as a sugary tea, which is then fermented with the help of a SCOBY that is very close cousins to the mother used to make vinegar. 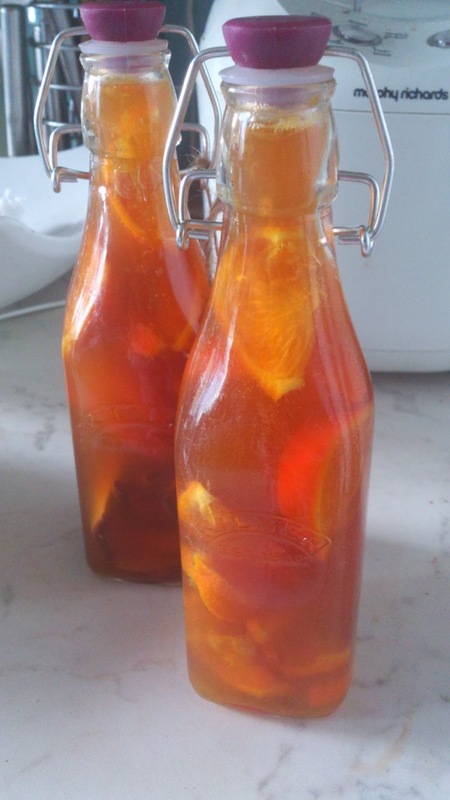 The scoby bacteria and yeast eat most of the sugar in the tea, transforming the tea into a fizzy, refreshing healthy beverage full of probiotics with low sugar. Lets take a moment to imagine carbonated sodas.. The cool stuff that floats on top, it’s rubbery and slightly spongy, brown stringy bits hang from it. My 12 y old boy thinks its weird and fascinating. So do I. It would seem the bacteria and yeast form this jelly-like layer of cellulose at the top of the kombucha to protect the fermenting tea from the air and help maintain a very specific environment inside the jar and shield it from unfriendly bacteria. It has been around for a very long time -before our modern disinfectants and anti-bacterials 😉 If the SCOBY is healthy then the Kombucha will be. It is a living thing and changes are normal and will usually reflect changes of the environment (your kitchen) It will smell nasty and cheesy rather than vinegary if something has gone wrong. If you see signs of mold, throw it all away and start from scratch. If the scoby becomes black, or develops green or black mold, it is has become infected or is past its life span and will also need to be thown away. Look after your magical weird and friendly SCOBY and it will look after you. Make your tea carefully and peel off the bottom (or oldest) layer every few batches. You could give it to a friend to start their own along with enough brew for a starter tea. Failing that you can purchase them online, be sure to validate their quality. You can also make your own starter tea using cider/unpasteurised white vinegar. Starter tea is acidic and keeps out the unfriendly bacterias during early brewing. 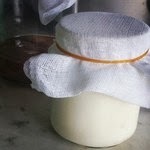 Slide the SCOBY onto to the top (do not wear gloves) cover with cheesecloth or paper towels and secure with an elastic band. It needs to be breathable but able to keep out fruit flies. 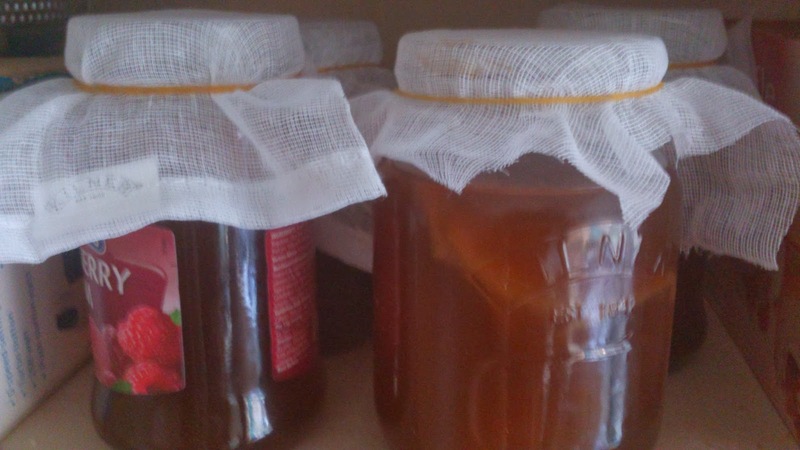 I now have a ‘Kombucha cupboard’ The scoby multiplies with every use and you keep a continous cycle going. Place somewhere warm and preferably dark (certainly not in direct sunlight or a draught) and where it wont be knocked. for around a week to 10 days check on it occasionally, you should see the SCOBY growing and the stringy bits forming. It may be positioned anywhere in the jar. You can taste it once it smells vinegary, if the SCOBY has formed use it now if you like it or leave it til it has a more appealing flavour. Almost forgot. This is really cool. 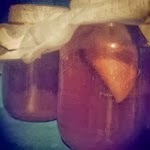 Remember one scoby will make whatever size batch you require. You could make a bathtub full and it will make a bath sized scoby! If you dried that out what could you do with it? well this lady made a bit of an interesting breakthrough in the textile industry with shoes and a skirt! 😀 http://blog.ted.com/2014/02/05/the-skirt-and-shoe-made-from-kombucha/ Are you getting ideas for patchwork scoby’s? or you could just compost them. You’ll be pleased to know this is a bit easier. You will need a friend to donate a little with some grains in, the Kefir grains are the SCOBY. Milk Kefir (you can get water kefir too) is a lot like the expensive yogurt drinks you can buy but they are a lot more expensive and less effective. Kefir also has the added beneficial yeast as well as beneficial bacteria. It also reduces the lactose content of the milk by quite a bit. Add the grains to your prepared jar and add your milk to the jar, you could experiment with how much to use, the grains will grow and multiply over time. Then leave the jar in a warm spot in the kitchen until it thicken, typically a day or two. 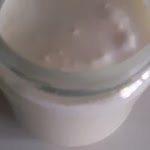 The flavour changes over time and becomes more tart and thick when it begins to seperate into curds and whey, at this point or just before you should stir the jar again and strain the grains to use again. The liquid is your lovely creamy, tart, probiotic drink. You can make it into fruit smoothies or even leave the kefir to a point where you can make cheese my straining through a cheesecloth and pressing. My grains are still multiplying but when I have enough I want to have a go at this! You could flavour kefir cheese too with fruit or herbs. Store unused grains in the fridge or pass on to friends 😉 You can also eat them or compost them. Its so easy to make the most of natures abundance and to learn from her. Get outside. This is just a quick reminder if you were thinking of using elderberries, its so easy! You need to discard as much of the stem as possible and just use the berries. Remember to leave some onthe bushes for the birds and take a pair of scissors so you dont have to tug at and snap at branches. I usually have a bag on my wrist and do a ‘snip and drop’ action haha 🙂 less mess as the berries can stain and a lot easier. You need wash them either before or after they are removed from the stems and crush them lightly with a masher. Fill a jar with your crushed berries leaving an inch or two from the top. Cover the berries with a spirit of your choice and fill to the top. It will ast for a year or two. Easy.